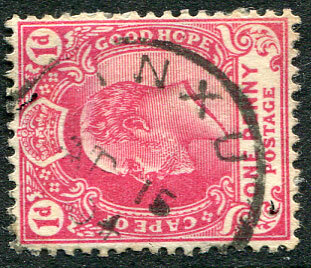 in previously unrecorded red ink on 1877-79 QV 1d lilac Crown CC wmk P.14 (SG.5), stained perfs at top. 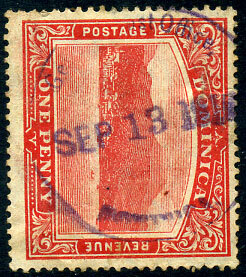 The only current association that can be made is a single example of a DOMINICA 20½mm cds dated FE 21 83 struck in red ink on QV 4d blue (SG.7). 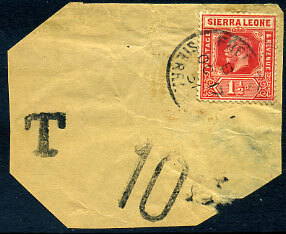 AP 19 11 on KE7 1d (SG.71) piece. AP 15 04 on KE7 1d (SG.71). 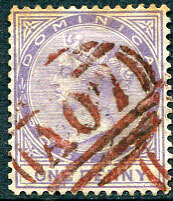 (D1) the first dated example in purple ink for 13 MR without year on KGV 3c MCA wmk (SG.45), some toned perf tips at top. 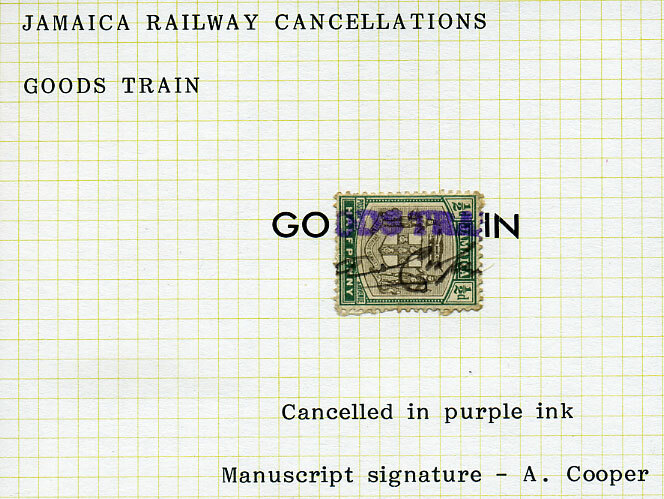 Newly discovered and previously unrecorded HEILBRON RAILWAY OFFICE dated 24 DEC 1910 in purple ink on KE7 2d (SG.141). Proud unlisted temporary rubber str. line with separate 21.AUG.30. str. 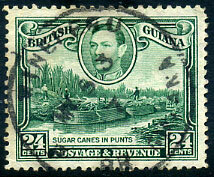 line date on KGV 15c (SG.95) piece. 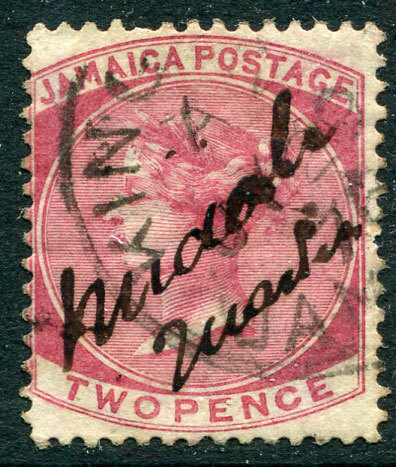 NEWLY DISCOVERED manuscript "Middle Quarters" on QV 2d Crown CC (SG.9a) dated Kingston A/JY 29 76 used pending the arrival of the "A.82" numeral, currently unique. 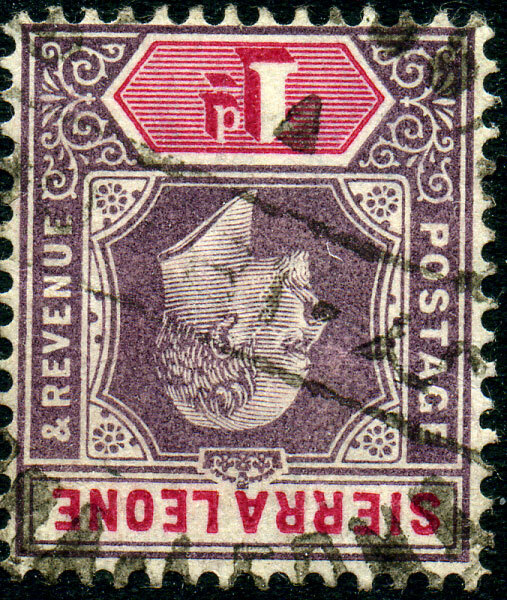 part strike in purple ink on QV 4d Crown CA wmk (SG.16), previously unrecorded. 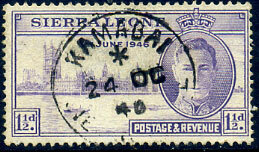 (T.34, Proud D1-1 but not listed showing "A" of "PA" omitted) MY 7 53 (reads MY 5 3/7) on KG6 24c (SG.312). hand-drawn in a differing style to those illustrated Ludington and Proud handbooks dated NO. 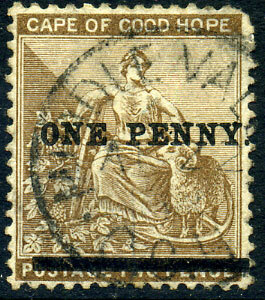 20. without year on QV 1d (SG.48), some clipped perfs. 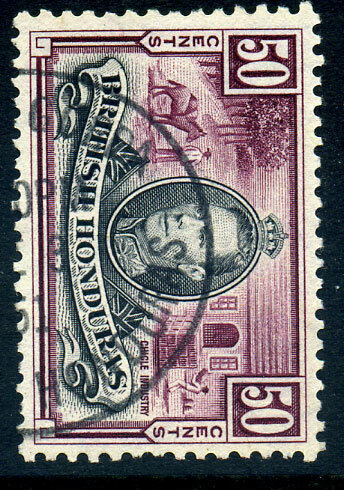 (S4a, Proud unlisted with JAMAICA GOVERNMENT RAILWAYS at top) in unrecorded purple ink dated NOV 25 1924 (LRD) on ½d Exhib (SG.94). 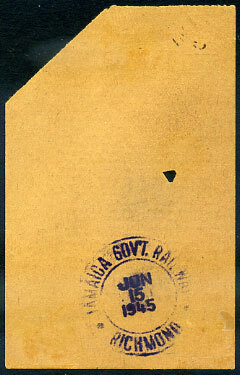 (S3,D2 in unrecorded purple ink) dated JUN 15 1945 on reverse 2nd Class cheap fare ticket to Riversdale. previously unrecorded large part straight line in purple ink on ½d Arms (thought SG.37 but some paper adhers) with manuscript signature of "A. Cooper" below. Currently unique. 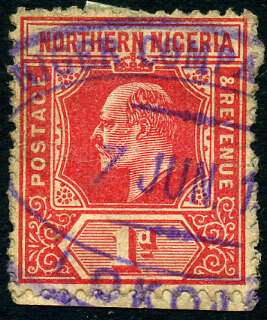 unrecorded purple d/ring oval part dated 7 JUN 1--- on Northern Nigeria 1910 KE7 1d red (SG.29) fragment. 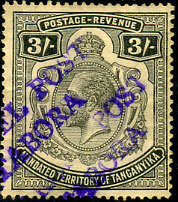 a new type (not conforming with expectations Topaz S3 or Proud D3) in blue dated JAN 10 1924 on 1d Arawak (SG.95) piece, some faults. 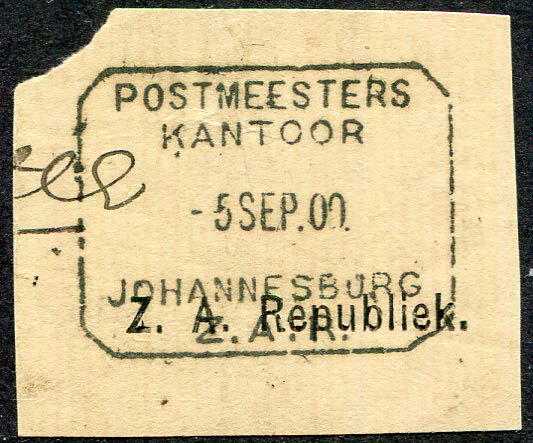 interprovincial dated NO 28 10 on CGH KE7 1d (SG.71). newly discovered and Putzel unrecorded skeleton relief interprovincial dated R/AP 16 12 on block of five TVL KE7 1d (SG.274). newly discovered and Putzel unrecorded skeleton dated 16 11 37 on SA 1d. 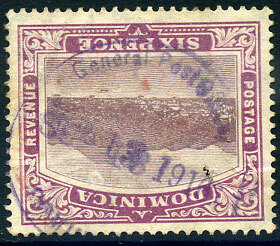 Newly discovered Proud unrecorded boxed purple handstamp used for parcel post on block of six KGV 6c (SG.46), some creasing and age stains. (T.4) E/NO 12 08 on KE7 3d (SG.25). 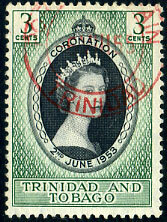 Proud unlisted red ink dated 5 VII 55 on QE2 3c Coronation (SG.279). 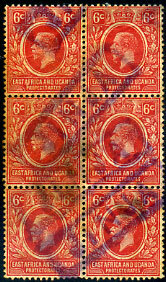 on 1866 QV 4d vermilion Plate 8 Large Garter wmk (SG.94 but unlisted used abroad), partial manuscript "Stamped", short perf. top left. part strike on QV 1d OFFICIAL (SG.04), full perfs, extremely rare on this. 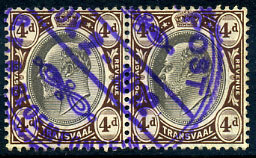 Putzel unrecorded interprovincial dated NOV 2 1912 in purple ink on pair Transvaal KE7 4d MCA wmk (SG.265). 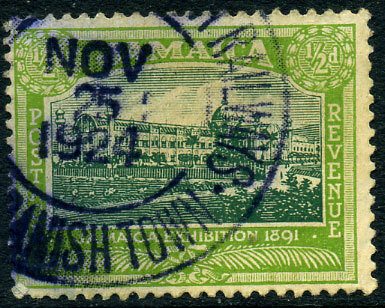 (T.34, allocated D1-2) corrected spelling skeleton retaining spaced VILLE PA (Proud unlisted as such) dated 15 DE 52 on KG6 1c, 4c, 6c piece. 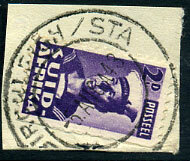 Putzel unrecorded dated 5 AUG 43 on South Africa 2d. 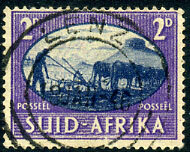 Putzel unrecorded dated 18 JAN 46 on South Africa 2d. 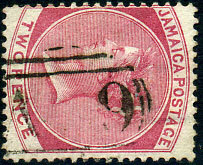 (10½mm high) assumed JAMAICA-PAID showing JA 24 on lower line (similarly to Proud PD14 recorded FE 8 1889 to AP 7 1897 but with square, rather than rounded, corners) together with KINGSTON, JAMAICA cds dated C/JA 24 76 on QV 1/- CC wmk (SG.13), horizontal bend and perf. faults. 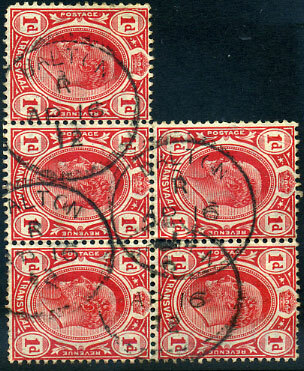 The later PD14 stampless covers are struck in red and have similar red crayon amount alongside. 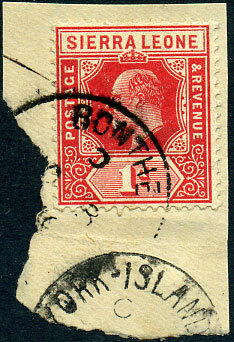 A single cover to UK dated NO 9 61 has QV 1/- for postage and QV 6d for late fee. 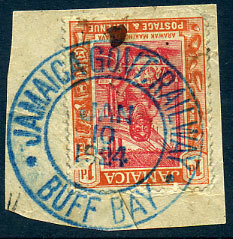 Therefore it is plausible that a similar cover to the JU 5 76 known cover to Belize franked QV 6d could have had 6d postage plus 6d late fee and been paid with QV 1/- stamp. 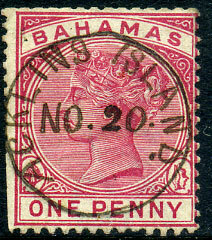 The handstamp would have acted like a Crowned Circle to distinguish as such rather than the letter read as double 6d rate. (0.73.02) B/MY 2 08 on KE7 1d (SG.100), corner perf. fault. 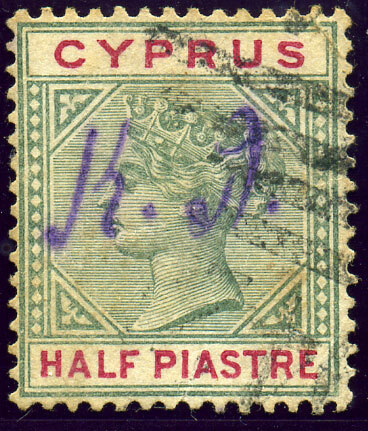 (150.02) previously unrecorded sideways down top to right B/1 FE 44 on KG6 1½d (SG.190a). 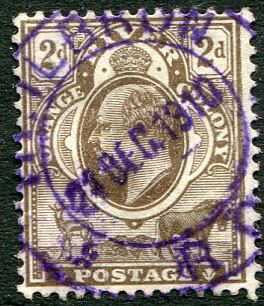 previously unrecorded purple ink TRD dated SEP 13 1916 on 6d View MCA wmk (SG.52). 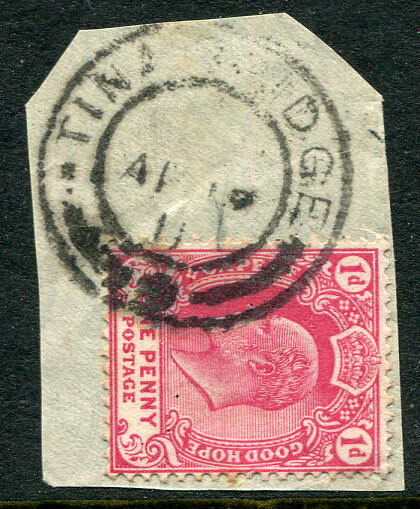 previously unrecorded purple ink TRD dated SEP 13 1916 on 1d View MCA wmk (SG.48b). 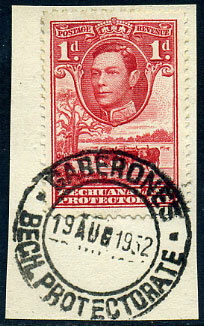 (060.02, wide M) */24 DE 46 on KG6 1½d Victory (SG.210). (164.02) coded "C" and showing full office name alongside KE7 1d (SG.100a) tied BONTHE reversed C/NO 8 10 on piece. No example of 164.02 recorded in both Walton and Proud handbooks. newly discovered dated AP 22 -- (weak or without year) on ONE PENNY. on 2d (SG.57a), rounded corner perf. No example recorded by Putzel. 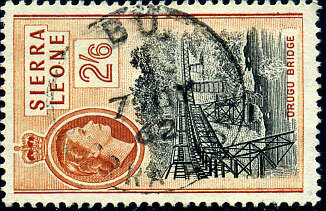 (Walton unlisted, allocated 016.09) dated 7 JY 62 on QE2 2/6d Railway Bridge (SG.219). A/2 FE 03 on 1d (SG.69). 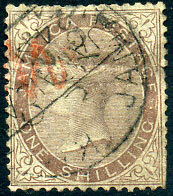 (Walton unrecorded 10 x 12mm) alongside handstruck 10c (Proud UP20) being underpayment expressed in gold centimes on KGV 1½d (SG.133) piece pmk'd Freetown B/OC 17 31. 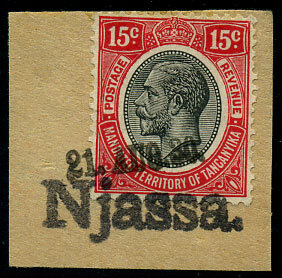 (047.01) dated JY 18 04 (inverted) on KE7 1d Crown CA wmk (SG.74). 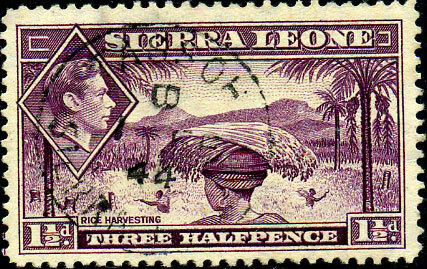 Illustrated Page 40 of "The Postmarks of Sierra Leone 1854-1961 Second Edition" by Walton, Quirk, Hamilton, Horry. newly discovered purplish-black 25mm cds dated F/OCT 24 84 on 2d (SG.49), full perfs. newly discovered with BECH. 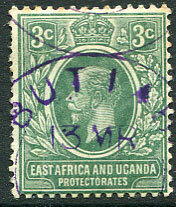 PROTECTORATE at base dated 19 AUG 1952 on KG6 1d (SG.119) piece, typed text on reverse. newly discovered QV 2d deep rose Crown CC INVERTED wmk (SG.9aw), currently unique. 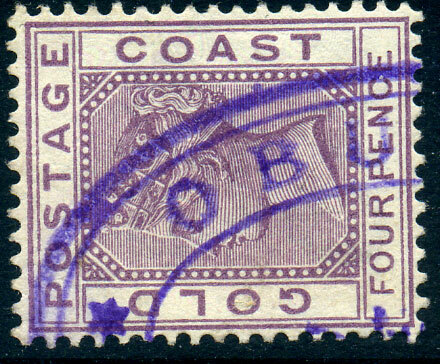 newly discovered purple 2-line handstamp on 1927 KGV 3/- black (SG.104, Cat.£80).